on one of the hills of the Lebanese town of Rashaya Al-Wadi stands a historic castle that has witnessed major events in the country's history. The castle of Rashaya, 100 kilometers from Beirut, is called the "Independent Castle" or "October 22 Castle" after the date of the country's independence. Major events witnessed by the castle include a major battle that occurred on October 22, 1925, when fighters of the Syrian revolution led by Sultan Pasha Al-Atrash intruded into the castle to liberate it from the French. 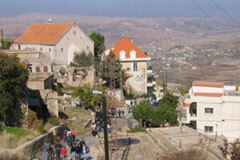 The castle also witnessed important events on Lebanon's Independence Day on October 22, 1943. The Rashaya citadel or Citadel of Independence has been declared a national monument,having been first built as a palace by the Shihab family in the 18th century. It is now stationed by the Lebanese Armed Forces and can be visited and seen under the army's surveillance. Under the French Mandate and on 11 November 1943, Rashaya witnessed the arrest and the imprisonment of the Lebanese national leaders in its citadel by the Free French troops (Bechara El Khoury (the first post-independence President of Lebanon), Riad El-Solh (the Prime Minister), Pierre Gemayel, Camille Chamoun, Adel Osseiran). This led to a national and international pressure in demand for their release, and eventually obliging France to obey. On November 22, 1943, the prisoners were released and that day was declared the Lebanese Independence Day.